When you make a reservation of 1 week stay in our Farmhouse Canale, you have the opportunity to visit the most important cultural and artistic centres of Tuscany such as Volterra, Pisa and Florence. We find in a strategic location. Read more information about the area HERE. Do not forget! The farm has 8 apartments to suit different requirements of accommodation. And what more? available just for bookings made between April and October: FREE guided walk Peccioli, Chianni, Laiatico three characteristic medieval villages in Tuscany. A walk to travel back in time! Visit to a wine cellar with wine tasting for FREE! 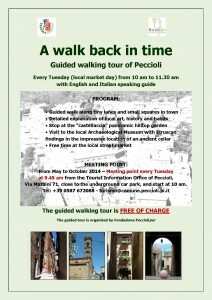 Every Tuesday (the day of the local market) from 10:00 to 11:30 / 12:00 pm with Italian and English speaking guide.